Mit dem kostenlon Photoshop-Plugins Fontea kann man auf die ca. 700 Fonts aus Googles offiziellem Typo-Katalog zugreifen. We are Source (madebysource.com). We stand behind some great Photoshop plugins like CSSHat, PNGHat or Subtle Patterns. 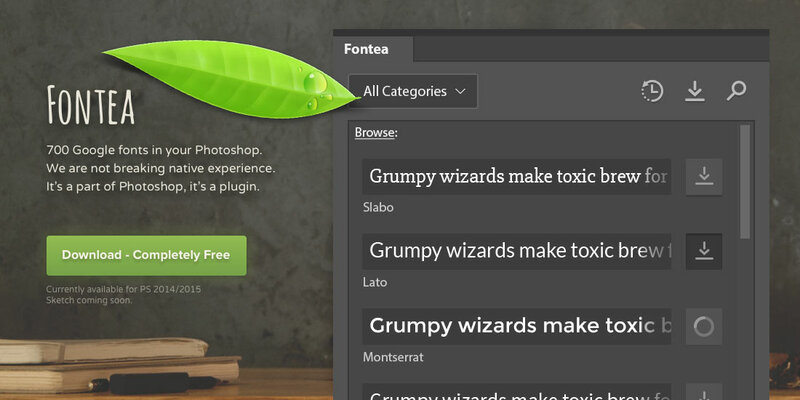 Now, after a year of maintaining our products, we want to introduce you a brand new plugin Fontea. It’s powerful, easy to use and completely free tool that will change the way you are working with fonts in Adobe Photoshop. Fontea is a free tool that allows you to easily apply all 700 Google fonts with one click in your Photoshop and it’s not braking the native workflow. So if you need a new font to brighten up your website, app UI, banner or whatever, you just open the plugin in Photoshop, select the font layer (or layers) you want to edit and click on the font you like. Boom ­ it’s applied. Do not hesitate and download the plugin ­it’s completely free! If you need any graphics, some basic ones are included in the press kit. You can always ask us if you need a different one. Also if you have any special request don’t hesitate to contact us at team@madebysource.com, we will do our best to help you. Thank you very much! Please, let us know if you publish something.